Nothing irks me more than people who say “you shouldn’t go there, it is so dangerous.” 9 times out of 10 the person who says it is so dangerous has NEVER BEEN there. Their mom’s neighbor’s daughter’s boyfriends uncle went there once on a cruise and was robbed in the cruise port. Oh really. You don’t say. It must be too dangerous for me to go. Just recently I was discussing travel with a friend who in reality should have known better than to tell me that “you shouldn’t go there, it is so dangerous.” I’ll give you one guess which country she was talking about, yes, Mexico. American has somewhat of an underlying psychological fear of Mexico these days. I don’t know if it is the incessant news of drug cartels or shootings, but we are downright frightened to go to our neighbor in the south. Let alone that the same reporting of violence in one major U.S. city would probably make most Mexican’s think twice about heading to the U.S. Like anywhere else in the world, you need to travel smart, watch where you go an avoid dangerous situations. As I always say, if you wouldn’t do it at home, why would you do it abroad? I love Mexico, I love the culture, I love the people, I love the landscape and most of all, I love the food. After her comment I starting enumerating the reasons someone should go to Mexico now. What would you add to this list? Is it a fair list? That means your money and your impact can go a lot further. Shop and stay locally. You are a more valuable cultural ambassador during low season than high season. Act like one and enjoy it! That’s right, more and more companies are heading to Mexico to set up shop, and not just manufacturers or outsourcing companies. Mexico’s middle class is growing as are the number of well educated young people. There’s great opportunity there now if you’re willing to become immersed. Last month The Economist ran an article about the global Mexican, read it, it might open your eyes. Mexico’s rich and diverse cultural heritage means one thing-if all you know is 5 de Mayo and Day of the Dead, you are missing out on an amazing cultural experience. Time your visit to coincide with a fiesta or holiday and if you can, couchsurf or stay with a family and ask questions about everything. Oh yea and my favorite reason you should go to Mexico? The food and the people. They go hand in hand. Mexico’s National Anthropology Museum in Mexico City (Museo Nacional de Antropologia) is a good place to spend a few hours, even if you aren’t a history buff. Between the interesting architecture of the actual building, the fantastic sculptures on the outside, and the impressive exhibits inside, I have to rate this as an A+ museum. 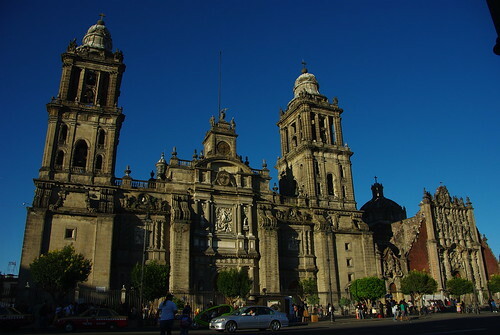 The most famous exhibit inside is without a doubt the Piedra del Sol, or the Aztec stone calendar unearthed in the Zocalo while doing repairs on the Cathedral. It was fascinatingly large, much larger than I expected. 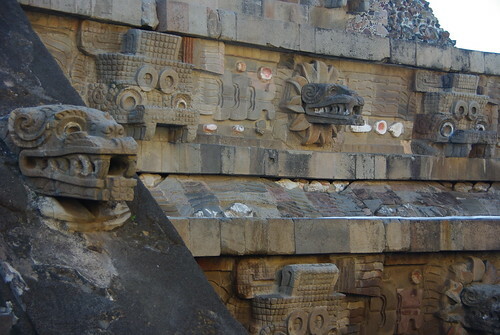 Some years ago, the facades of Aztec temples were rebuilt or transferred to the museums gardens. We wandered into the garden only to find ourselves in a bit of a jungle-like Aztec temple dream land. Several facades and even full buildings hidden along a gravel path gave us somewhat of an “authentic” jungle explorer feeling. 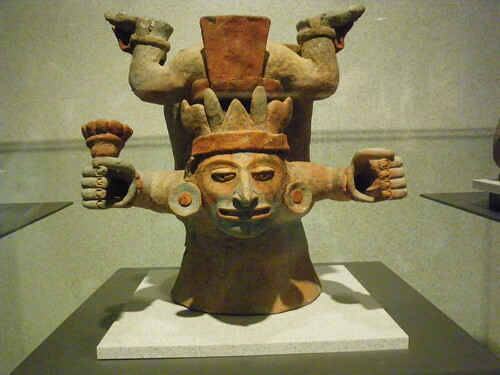 IF YOU GO: Mexico’s National Anthropology Museum in Mexico City hosts a number of cultural events and activities, which are worthwhile if you can time your visit properly. 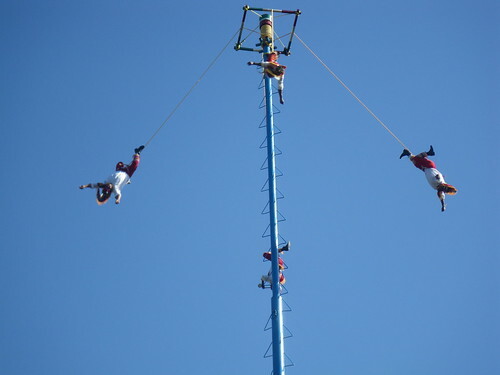 We caught the ritual ceremony of the Voladores, where men climb to the top of a pole and hang off the top as the pole spins, gently unwinding them down to the ground. Note that the museum is closed on Mondays, and check the hours before you plan your trip. 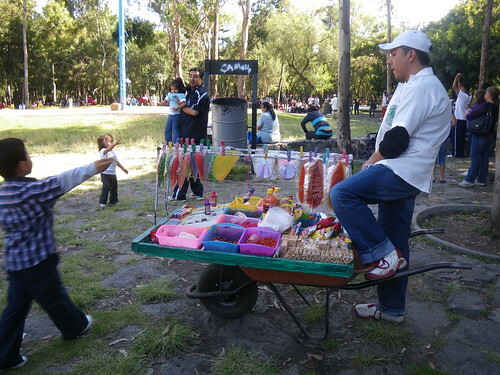 Read more about our travels in Mexico City. You may not recognize the name, but if you’ve been to Mexico you’ll likely recognize the brightly colored sculptures of fantasy animals and creatures. 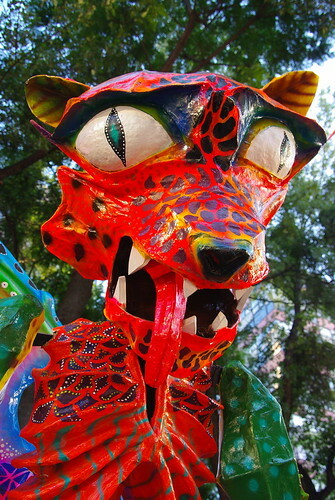 First created in Mexico City by artist Pedro Linares, alebrijes can be made of paper mache, wood or even metal and are often creatures most associated with fantasy or dream-like worlds. 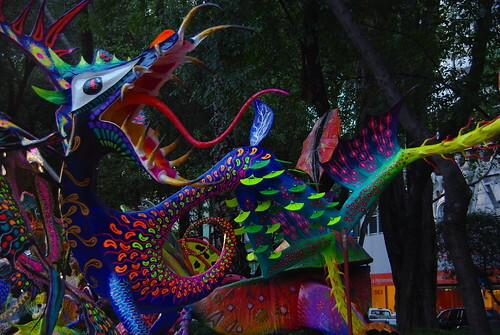 Brightly colored, alebrijes are commonly associated with Mexico City and Oaxaca. 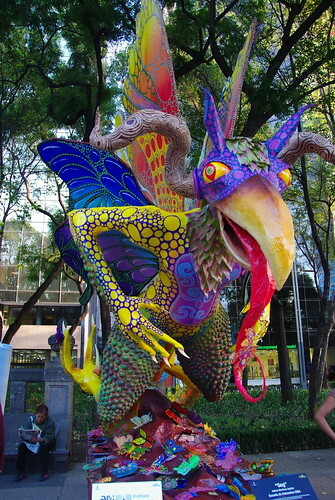 Both cities host alebrijes festivals, art shows and even parades to display their craft. These festivals are generally held in October, November and December to coincide with Halloween, Dia de los muertos and the Christmas craft season. 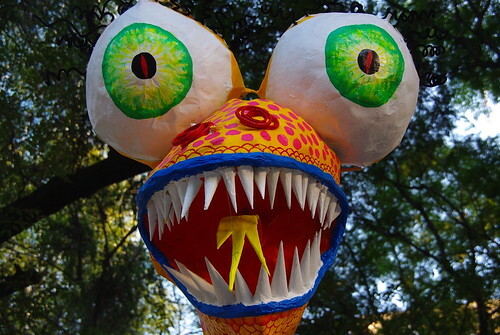 Here are some pictures from the fifth annual monumental alebrijes parade held in Mexico City. Each alebrije was created by a different art school, museum or community organization. 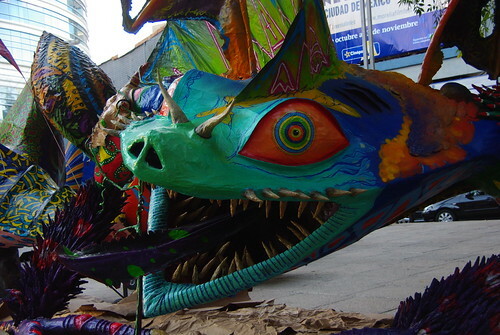 Sponsored by the Museum of Popular Art, the parade ended along Paseo de la Reforma where the alebrijes were put on display. 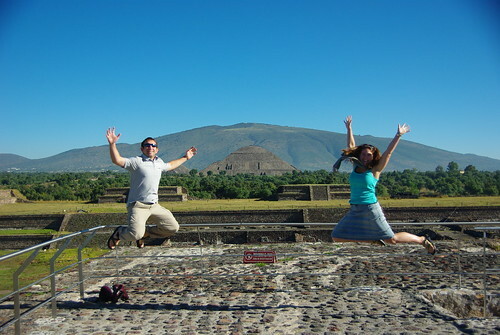 Teotihuacan… say that five times. The Aztecs are a civilization of legend. From enormous pyramids to human sacrifice to accounts of gold and tremendous wealth they’re a people and a culture that’s become a symbol of Mexico. Teotihuacan, their capital was likely one of the largest cities in the Americas before the Spanish came. At its zenith, the city may have been home to over 200,000 people. With modern amenities like trash collection and multi-story apartment complexes, and practices such as bathing 2-3 times per day, the city was likely a shock to Europeans who were coming from cities where urban live was at the very least unhygienic and unpleasant. 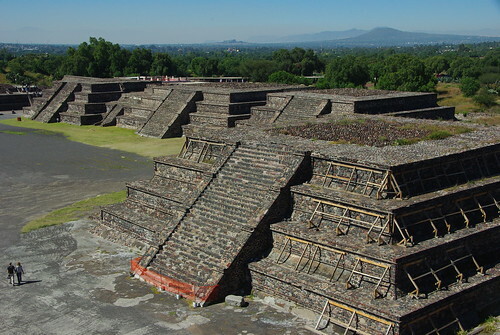 Today Teotihuacan remains part of one of the largest cities in the world. About 30 miles outside Mexico City, the ancient site is enormous, even by today’s standards. Evidence of large residential complexes, specialized markets and enormous religious buildings remain. 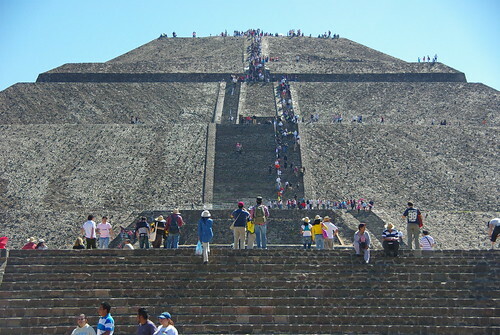 Teotihuacan’s Temple of the Sun and Temple of the Moon are the most visited archaeological sites in Mexico. Fortunately we toured the site before the crowded tour buses rolled in. From atop the Temple of the Sun a huge expanse of river plain laid out before us. Today it’s dotted with villages, roads and parking lots, but during the time of the Aztecs, the view from atop the Temple must have been breathtaking. Like many archaeological sites, the line between preservation and conservation has been blurred with construction. Much of the Temple of the Sun has been rebuilt. In fact, today the Temple has one more level then it did when the Aztec’s used it as a religious building. Go figure. We climbed from temple peak to temple peak. Most of the colorful murals have been removed to museums, but a few areas of decorative tile still exist. I was struck by the similarity of the site’s layout and design to other Pre-Columbian sites and religious center’s we’ve visited throughout the Americas. Teotihuacan’s Temple of Quetzalcoatl (or the feathered serpent) bore a striking resemblance in both construction and motif to Huaca del Sol (Burial place of the sun) in Trujillo, Peru, so much so that I had to wonder whether the Aztecs and Moches (builders of the Huaca del Sol) had any interaction. Interestingly enough the Huaca del Sol is also situated near a Huaca de la Luna. IF YOU GO: Unsurprisingly the site has little shade so go early and bring plenty of water. There are steps and handrails up most of the pyramids, but respect the barriers and don’t walk beyond the paths. Many Mexican’s believe the site holds special energy- you may see ceremonies or rituals designed to draw in the energy- be respectful and maintain a distance as for some people these ceremonies have deep spiritual meaning. The site is completely mobbed during the solstices because of the energy and alignment with the sun. Yes, we had to do it! Mexico City, Cuidad de Mexico, D.F. Mexico City is a place with many names and many personalities. Those were pretty much the first words that came to my mind when I thought about Mexico City and yet, we despite not a single positive word that came to mind, were drawn to visit. 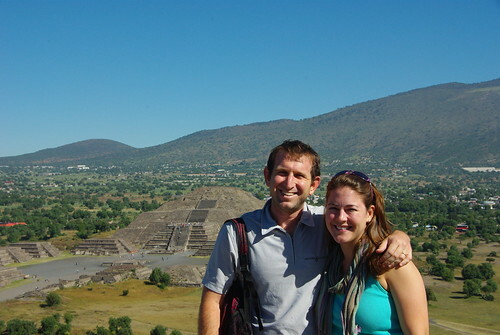 Having skipped Mexico City the first time through Mexico in 2009, we were determined to cross it off the list. It feels like we’ve had a taste of everywhere else in Mexico, so we might as well take a stab at the heart of darkness, literally. And so back in the travel saddle, we found ourselves passing a few days in Mexico City before a wedding. On our first day in town we went to probably one of the most impressive anthropology museums in the world. The Museo Nacional de Antropología covers all of the famous pre-Columbian peoples in Mexico from the famous Aztecs to the lesser known Toltecs. It was a bit like traveling through Mexico again, each room we visited was another stop through memory lane. Food stalls hawked chili covered peanuts and fried grasshoppers. On our second day we spent the morning exploring explore Tiotihuacan and the in the afternoon Templo Mayor. I stood in the middle of Aztec ruins, looking at the stone altar where they performed human sacrifice. The city and traffic buzzed around us and the bell tower of the second largest cathedral in the new world shaded us from above. On our third day I sat in the Zocalo, drinking an ice cold beer, watching the numerous vendors hawk their wares, sat in on a children’s theater performance for dia de los meurtos and watched a man cut himself with glass for money on the metro. How on earth can I add all of this up into one cohesive tale? It’s like being a part of the Palo Volador, multiple personalities spinning through the air. My story of Mexico City is much the same of the city it’s self. Layers upon layers of interesting history, hidden gems and stories worth exploring. We crossed the city on the metro, zipping underneath fancy neighborhoods, rundown areas of town, old churches, new sky scrappers and high-rises. The city once paved in gold according to Cortez now sits uncomfortably crowded in the middle of a drained lake, a population pushing resources to the brink. And yet parts of it remains charming. The city parks are alive with young lovers, families and friends enjoying the freedom of sunshine. 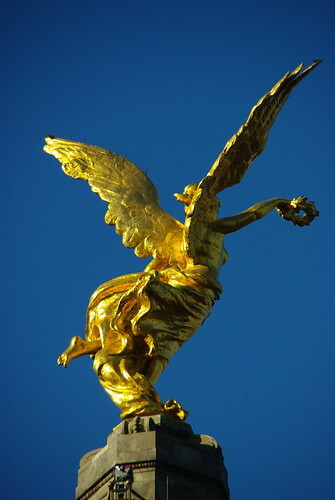 The base of the angel statue is dotted with teenagers and adolescents hanging about and wherever you go you are greeted by a genuine smile and a firm handshake. It is a city of discrepancies, a city of multiple personalities not easily summarized in one story.